I am finally back in Bangalore after a 2885 kilometre round trip spanning over 7 days! 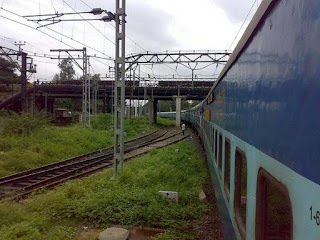 I started off on August 03 (Sunday) heading to Mumbai on board the 6530 Udyan Express. 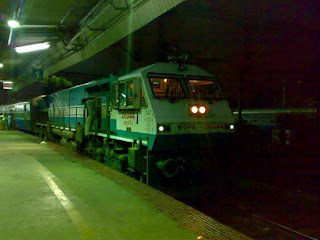 It was Krishnarajapuram WDP4 #20044 which did the honors of taking me to Mumbai. The train left Bangalore on time, and we managed to be not much delayed through the trip and reached Mumbai with a delay of just 3 minutes! It was then two rain drenched days in Mumbai, when i was busy to the core with time for nothing! Still managed to sneak in an hour long railfanning at Ghatkopar and Kurla. It was then time to head home...in Kerala! I took the Netravati Express from Lokmanya Tilak Terminus on August 07. The loco that did the honors on this trip was WDM3D #11149 of Erode. 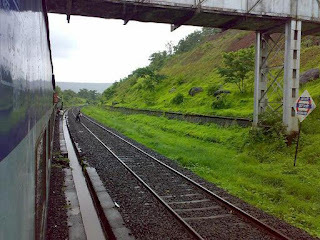 The run was normal, and we were more-or-less on time till we reached Kudal, but was about an hour late the next morning! Finally landed up at Trichur delayed by around 51 minutes. After a week long journey, its now time to head back to job in bangalore! 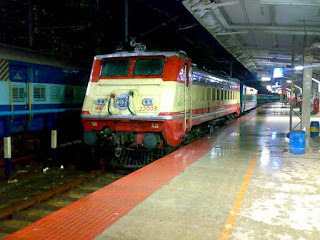 The usual run-of-the-mill trains are running full, and i decided to take the Kannur-Yeswantpur tri-weekly express. I am now waiting for that train to reach Shoranur - the station most convenient for me. The journey from home, at Kodungallur, to Shoranur was interesting - all the way by bus with a change over at Thrissur. I reached the station at 8 pm. The loco in the image above is a WAP1. The loco was spotted sleeping off at the platform. The arrival of my train is already announced - a full 30 minutes early! I can see the train already coming in! More details tomorrow! Oh! What a run! The monsoon restrictions on KR seem a bit relaxed this year around - thanks to the under performing monsoon! My train managed to keep good speeds every time it was possible. It was raining almost since we entered kr territory! We are now at Ratnagiri, just slightly behind schedule. We were made to wait for most crossings, but that doesn't seem to affect the spirits of our pilots, who just handed over duties to a new set. The occupancy in my coach is poor.. More details on the trip follows..
After spending two wet days in Mumbai, it now is the time for me to head back home. I am heading home, to kerala, on board the thiruvananthapuram bound Netravati express! I joined the train at LTT itself. 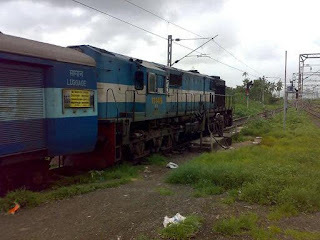 The loco working my train is WDM3D #11149 of Erode. We left LTT with a delay of about 2 minutes. We crossed Pen a while back, and are now blasting off towards Roha. The loco is a decent smoker, and the pilots are doing a really awesome job! More info on this trip would keep coming as and when GPRS reception is available.. Bye for now! The tortuous journey to Mumbai is almost heading to a close.. We were before time at Daund, and also at Pune home signal! We had a long-ish wait at pune home for that speck of yellow which would allow us in! Though we were before time at the signal, we got delayed by 9 minutes by the time we stopped on platform 4. We had to wait till the Mumbai - Thiruvananthapuram express pulled into platform 3. 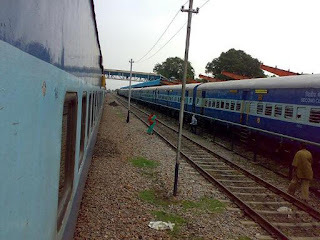 Platform one was occupied by a rake of Jhelum express and two was held by Gyan Ganga. The latter got twin MLY WDMx locos later! Platform 5 was occupied by a pretty early running Koyna express.. We finally left Pune at 1604, after accumulating a delay of 14 minutes! Hopefully we make up the loss by the time the train reaches Mumbai! Here we are.. Kurduwadi was reached at 1253, delayed by 19 minutes. We started moving out of this station at 1256. Its been raining almost continuously since morning. Its drizzling even at this moment.. More news as I reach mumbai..
Good morning! 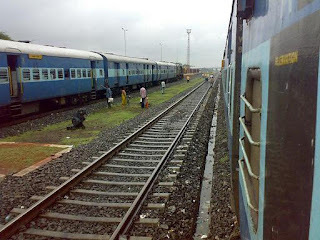 My train is now at Raichur - running late by about an hour and 30 minutes.. The reason for the delay is not known!